As you grow older, you realise (at quite an alarming pace) that many of your childhood friends are getting hitched! 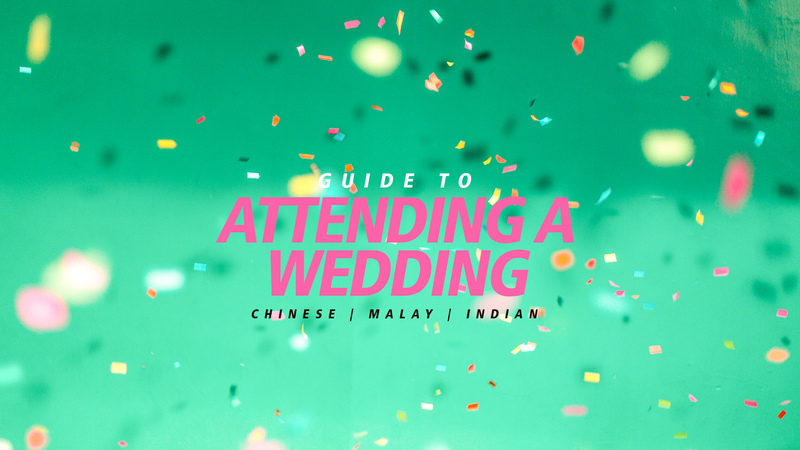 But as you panic about your personal love life and try to be happy for your friends, you’re faced with another challenge – knowing the wedding etiquette for different races in Singapore. No matter the location, dress for the occasion (yes, even if it’s the void deck). Majority of Malay families are traditional and would normally advise you to keep it modest – meaning a big ‘NO’ to t-shirts, tank tops, spaghetti straps and especially, shorts. As there are no specific colours to avoid, think smart casual and you should be safe. Ideally, a long dress with flats or heels for the ladies and chinos with a button-down shirt for men. Bonus points if you turn up in the traditional baju kurung. Malay weddings typically go on for hours (i.e. 11am to 5pm), but guests are definitely not expected to stay throughout. You pick a timing that’s suitable, and just turn up. Just a heads up – the bride and groom might not be on the dais when you arrive, so the timing really depends on you. If you really want to catch them on the dais, your best bet is to just ask them for a suggested time. First and foremost, try to locate the parents of the bride or groom. They would typically be at the entrance with a table full of door gifts. Introduce yourself to them, and make your way to a table to commence with the best part of the wedding – the food! Apart from seeing your friends, I mean. Get someone to guard your belongings, and off you go to find your one true love, nasi briyani (and other variations of delicious rice). Take your time to eat and enjoy the (sometimes terrible karaoke) entertainment provided. And yes, seconds are allowed. Photography sessions with guests really depends on the couple and the flow of the event. As there would be plenty of people wanting a picture with the couple, you’d typically have to wait for upwards of 10 minutes. TIP: Try to avoid the lunch crowd by coming earlier or after 2 pm. Once you’re done with the food, make your way to the parents of the bride or groom to salam (a version of a handshake) and hand over the green packet. It really is up to you. Malay weddings aren’t known to be profitable to the family, so as long as you give from the heart – they’ll be more than happy to accept it. As a general rule of thumb, $10 for acquaintances and $20-$30 for good friends, should be sufficient. A general rule for Indian weddings is to dress appropriately. Whether it’s in a temple or a restaurant, it is always essential to remember that the outfits shouldn’t be too revealing or short. As our Indian friends are known to be quite extravagant, dressing up is very important. It’s either go big (and bright), or go home. Smart casual to formal outfits will usually do the trick – but look out for the information given on the wedding invite (some might even have theme). Temple wedding – The temple wedding will be an on-going event in the main hall of the temple, while dinner is served in a separate area in the same venue. As gracious guests, you should probably watch the wedding procession before having your dinner – but depending on the size of the crowd, nobody will fault you for having dinner first. There will not be a host to take you through the procession, and there will be a lot of things going on. But fret not, as the highlight of the event will be the tying of the ‘thalli’ or string, so look out for that! If you would like to take photos or congratulate the couple, join the line when you see it being formed. This is when you can also pass them your gift. Reception – It’s a party! You should be there on time as the event flows like a show. There’ll be a host to entertain, performances by family and friends and even games. If you’re overwhelmed by all the activities going on, the host will bring you through it. The night will end off on the dancefloor, and participation from guests is strictly encouraged, so don’t be shy! TIP: Be on time and get ready to be overwhelmed by the processions going on. This is not a typical sit-down dinner. It’s a gift, so any amount is good. A minimum of $30 is sufficient, but it could also depend on the number of people you go with, the location of the wedding as well as your relationship with the bride or groom. As for a closer friend, $50-$80 should do the trick. During the reception, you could either drop the envelope into the money box, or give it to the couple personally as they do their rounds among family and friends. Wedding banquet – As wedding banquets are commonly held at hotels and upscale restaurants, you should dress more formally for the occasion but not upstaging the bride and groom. In certain weddings, the theme would also be given along with the invite – so remember to check before buying your outfit. Warm tones like pink, peach, yellow and orange symbolises new life and happiness in Chinese culture, and would show your support of the union between bride and groom. Avoid outfits that are completely black and white for a traditional Chinese wedding as both colours are symbolic of death and mourning. Red should also be avoided because the bride will most likely be in that exact colour. Arrive early to mingle with friends attending the wedding over cocktail peanuts and drinks. You might even be able to catch the bride and groom! You should register at the reception the moment you arrive. The bride and groom will normally have a separate registration list. If you are invited by the groom, you should register at the groom’s side and vice versa. Place your ‘ang bao’ (red packet) in the box, according to the side you’re representing. Remember to write your name and a simple congratulatory message on the ang bao. TIP: If you are late for a wedding dinner, it would be best to enter after the first march in. Food and drinks will be served to you during the dinner, so all you have to do is to sit back, relax and enjoy the entertainment provided by family and friends of the couple. This includes performances, games, video montages and speeches that might sometimes, even make you cry. Interestingly, there is an unspoken rule of factoring in the cost of your meal based on the location (i.e. 5 star hotel vs 6 star hotel) or time (i.e. weekday vs weekend, lunch vs dinner reception) of the wedding – there’s even a website that you can check before the wedding! A typical ang bao gifted ranges from $88-$228 depending on the considerations mentioned and how close you are to the bride or groom. The general rule of thumb is to give in multiples of twenties rather than tens. For example, $160, $180 or $200, rather than $130 or $150. The Chinese culture believes it would be auspicious to give a monetary figure that ends with the digit “8”, as it symbolises fortune and serves as a good blessing to the newlyweds. It is necessary to remember that the Chinese would not give ang baos containing the number ’13’ or ‘4’ as it is considered inauspicious. Phew, you’ve finally come to the end of the article! And with that, you are on your way to becoming the best guests of any racial wedding. We realise that we’ve only covered the basics, and that there are many different styles of weddings that are happening nowadays – so please excuse us if we’ve left out some teeny, tiny information. Ultimately, be respectful and considerate to the special couple. After all, it is probably the biggest day of their lives.